The colours are actually much darker in real life and I'm quite happy with it. I will show my client and tell her to 'see' it darker and hope she likes it. I have been kind of hiding from the reality that I leave for Edmonton Thursday morning - as early as I can get out of bed. It's about an 8 hour drive, with a one hour shift in time zones. So I will arrive after dinner, most likely. While the workshop itself is pretty much under control, I wanted to bring a few other things - because I'm driving and it's no big deal to throw 'extras' into the back of the van. And clothing/personal items. Usually I start filling my suitcase up to 10 days ahead of a trip. I haven't even pulled it out of the closet. There have just been too many other things demanding my very limited resources. Tomorrow we shift all the rubble from the guild room back into the room and once that is done the trip to Edmonton will be the number 1 priority. Because, reality! When you are trying to sell your textiles proper labelling is a legal requirement. I have been steadily cranking out inventory for the fall sales and now have four large boxes and bins of things ready for this essential step. With a rather hectic schedule I have been ignoring the stack but cannot ignore it anymore so this morning I am trying to get everything caught up and decided to begin with this so everything can be moved to the annex and out of my dining room. The level of rubble has reached MY limit of tolerance! 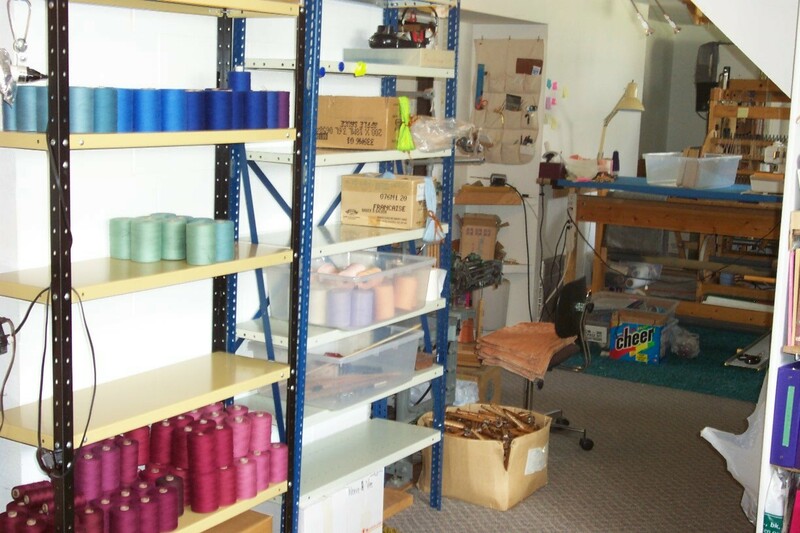 Not to mention I need the room next week so that I can begin the packing for Olds Fibre Week. I have to bring EVERYTHING with me, no dashing home at lunch to fetch some forgotten thing. Notice anything 'wrong' with this warp? No? 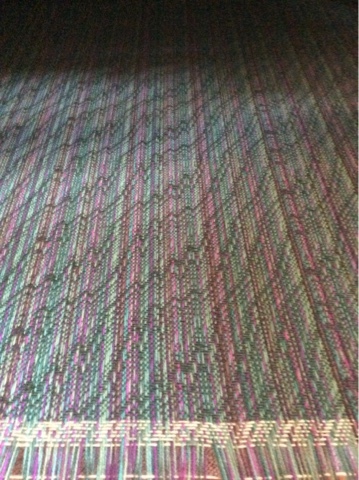 This is the first prototype warp for a new scarf line. The past few years I worked a lot with dyed warps but recently acquired a bunch of commercially dyed solid yarns. I had to think for a while about what to do with them and this warp is meant to test a design where the stripe sequence will be 4 x 4 for 1/3 of the warp, then 2x2, then 1x1. When a student asked if I wound the warp that way, I explained that I just wound one of each colour with my finger between them, then manipulated the threads so the colours were in the order I wanted them. I have done this before and, so long as the yarn has some elasticity and the shift from parallel isn't too great, never had a problem. Looking at the cross nothing appears amiss, but I also remove the lease sticks and once they are gone there isn't anything for the yarns to catch or hang up on. Now to sley, lash on (because slippery rayon!) and start weaving. And hope it looks like I hope it will! It was an incredibly intense six days. I had some personal stuff going on as did a couple of the other participants and it was good to just shut all that out and focus on weaving. And the information flowed practically non-stop, for the first three days. 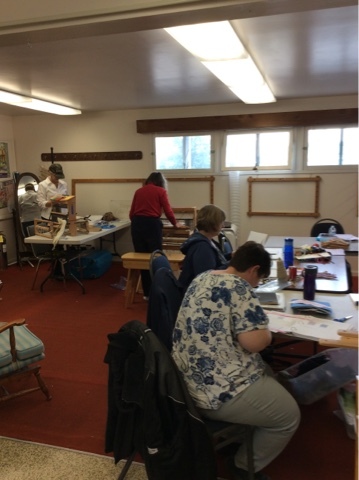 By Day Four I had cut my lectures back in order to let people get the weaving done and today, Day Six, was the oral presentations, then a few final demos that either had been forgotten earlier or just didn't have time to fit in until now. And then a final review of the homework to be done at home, clarifying what I would prefer to see. I also urged them not to go home and set everything aside until January, but to review the manual and start thinking about and working towards completing their homework. One person said she needed a palette cleanser and was going to weave some tea towels before she started thinking about the homework. 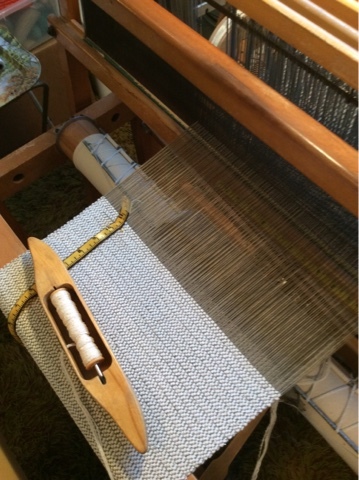 Which is not a bad idea - the main thing is that everyone make a commitment to doing some weaving, preferably every day, but at least once a week, so that they don't forget everything they have learned. 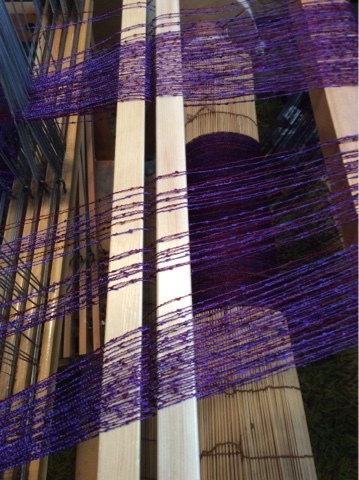 Weaving is a complex activity. Things need to be done in a consistent manner, frequently enough that bits and pieces of the information doesn't get forgotten from session to session. And burning new neural pathways can only be done with repetition in a fairly short period of time. If you don't use it, you lose it! 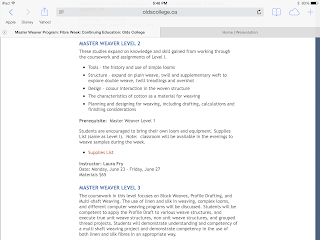 Some examples of student learning exercises related to value. If someone doesn't have an instinctive sense of how to work with colour the eye can be trained by such exercises, looking at how the value of a hue can be changed, and how different values play together. If a light, medium or dark value of any hue is used, the same applies. Another mantra is: value is more important than hue. I quite often use very dark values of purple, blue, green or brown rather than black to good effect. 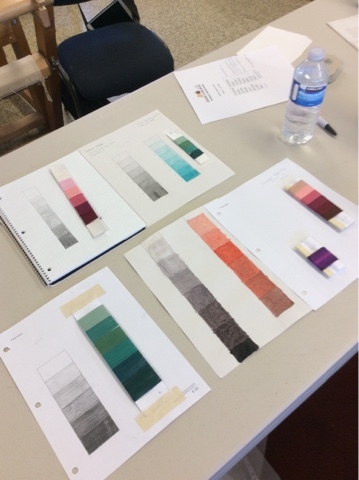 One way to develop an eye for colour is to use watercolours and try to make a value scale, or do yarn wrappings. The more you work with colour, the better able you will get at putting effective combinations together. Work is well underway at the closing of day two. I talk a lot, mainly because there is so much to say. Hopefully everyone will be able to get their class work done in spite of me. ...I shall wear red and purple..."
The colours in this photo are much lighter than in real life. The red is so dark and more into the blue, so it actually does 'go' with the purple. 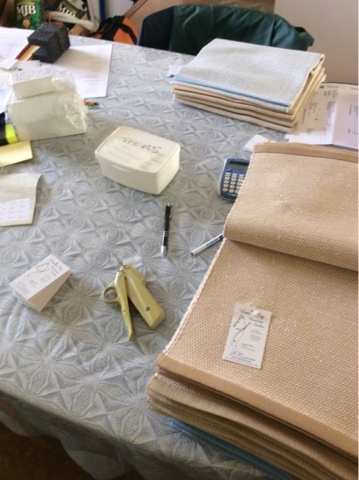 I will weave a full sized sample and see how well I like the finished results. I have used this yarn before in the warp and had no particular problems with it, but usually mixed with smoother yarns. So I don't know if having only this yarn in the warp is going to work the way I want it to. Sample, sample, sample! For now, I need to get back to the loom and finish this place mat warp. Then do one more before starting this prototype warp. I feel like a one armed paper hanger at the minute. There are so many things to juggle I am having a hard time staying on track to finish any one thing. 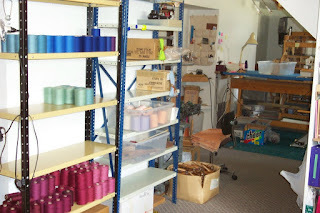 I wish my studio looked this neat and tidy right now - there are boxes piled all over as I try to sort through some of the yarn I bought in March, mark one more level one students homework from last year, attempt to get some place mat inventory woven and get ready to teach starting this Saturday. Truth is, I'm not really multi-tasking but doing one thing for a short period of time before the thought squirrels send me to another, then the next. I suppose I could call it serial tasking? I have also been checking schedules for the rest of this year and the start of next. While I am still healthy I would like to travel some more, and perhaps teach some more. I've been talking with a couple of people about expanding the Olds program to other locations. Whether or not I would be the one teaching those, I don't know. But it would be fun if it was. Doug is working on moving my stuff out of the annex - not a simple thing so it is taking a great deal of his time. I do appreciate his attention to detail. But the impending move is just one more thing in the back of my head - although I try to not think about it right now - there are too many other more pressing things to think about. But the class here is coming together nicely. Part of the challenge is that, since I'm teaching at home (so to speak) I can utilize all sorts of learning/teaching aides that I wouldn't ordinarily get to use because I can't transport them all. But it also makes for more work as they have to be moved to the guild room...and then back again. Still, it's nice that I have them for the students to reference. So - back to the serial tasking! It won't get done if I don't get back there and do it. Most people have no clue about what goes on in the background, behind the scenes, the hidden costs involved in getting things made. My schedule is a tad full at the minute as I juggle a bunch of different things, each with their own hidden agenda and out of pocket expenses. 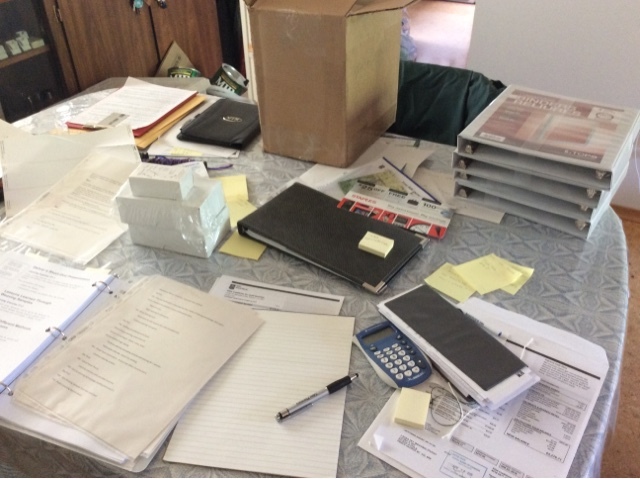 My dining room table is a microcosm with the rubble of several deadlines. My cheque book and deposit book that need to have entries made in my ledger (sight unseen). Bills starting to pile up, needing paying. Class manual with some of the many handouts, needing photocopying. Binders freshly purchased from Costco, into which the manuals will be installed, still in their shipping box. First warps for the students have been pre-wound for them and ALL of the skeins have been wound onto cones to save time doing that in class. (Say 'thank you, Doug!' When you see him, students). Warp for group warp is wound and will be ready to weave on when students arrive. Water colour paint boxes purchased along with a new colour wheel because I couldn't find my old one. Which insures it will appear, no doubt after class is finished. Even though I have taught this level before it was for five days. We have six here in PG (a good reason to take the class here...extra time to complete the class, an extra day with moi?). So, I spent an hour reviewing the manual, then listed all the learning exercises as a Check list for the students, then made up a six day schedule - a tentative one because much depends on how quickly everyone completes their work. If they are whiz kids, we could potentially do more. 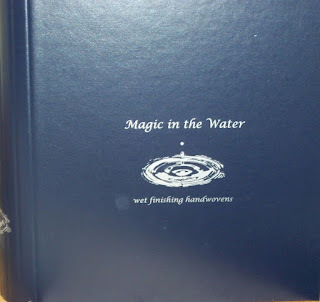 Magic in the Water; wet finishing handwovens went Out of Print a number of years ago. In 2011 (while I was undergoing chemotherapy) a friend helped me photograph all the samples from the book and another friend turned everything into a .pdf file which I have been selling via my website ever since. Anyway, now that I'm officially an Old Fart, I'm looking at ways to cut back All The Things and simplify my life. One of those things is my website and as soon as I can figure it all out, it will undergo some changes, one of which is that I will no longer be selling Magic there. That said, it is now available for sale via Weavolution. 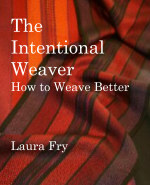 Erica and Oliver are working hard to make Weavolution work for weavers, and one of the things they do is host classes. 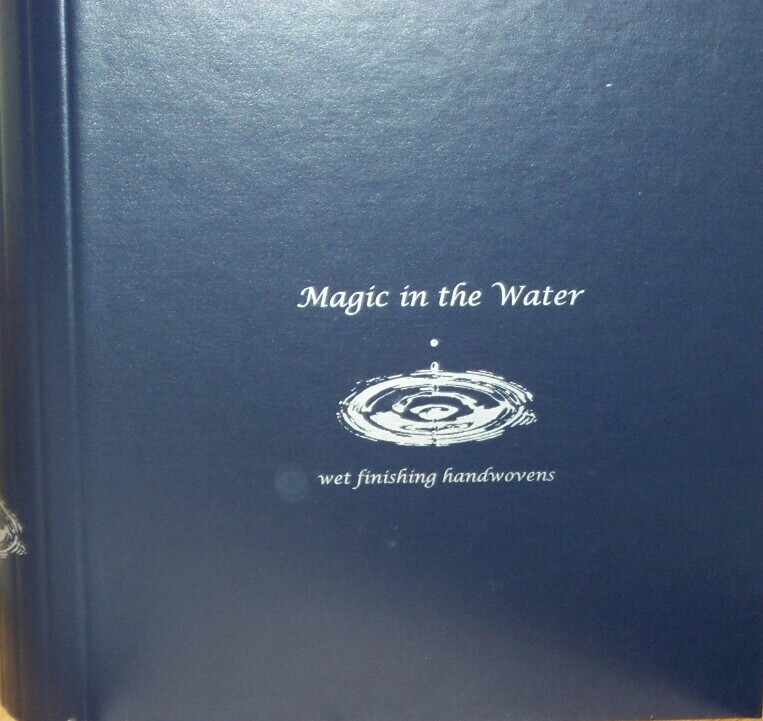 And now they will be hosting Magic in the Water. It is still a .pdf file, which can be purchased and downloaded. They have also set up a Group for people to share stories of their wet finishing adventures. And yes, I will be a member and any questions addressed to me will get answered, as best I can. Some people call me a wet finishing 'expert'. While I may know a little more than the average weaver, I have not woven with every fibre/yarn under the sun. But I will be happy to give my best guess. 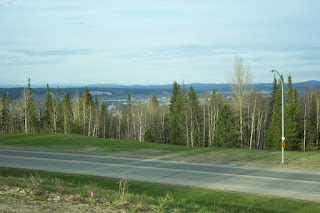 With the first Olds satellite class about to begin here in Prince George thoughts are turning to the future - because once level one is successfully completed, provisions need to be made for level two, right? And because not everyone who is interested was able to take level one this year, but might be ready next year...well, calendars have been consulted, plans drawn up, dates set aside. The next questions is - will there be enough interested people for level two to go ahead next year and will there be enough interest in level one next year? Who knows. Life Happens, sometimes in a big way and plans made can fall apart. 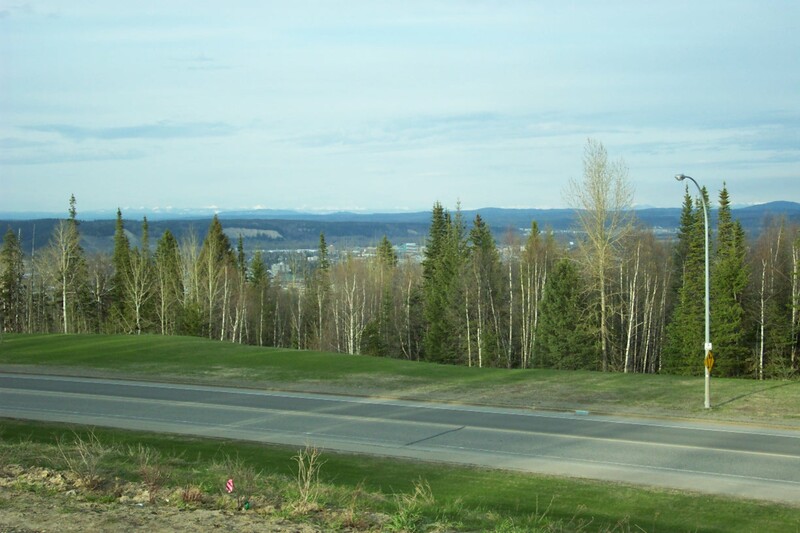 And so I propose that 2017 offer the following...in Prince George, level two May 20-25 and level one May 27-June 1. If I can remember how to post a survey to my blog I will add that to the banner to see if people are actually interested. If so, I will talk to the powers that be in Olds when I am there in June. What is really exciting is that a couple of people have inquired about having satellite programs in their neighbourhoods - stay tuned! People new to the craft of weaving are usually looking for definitive answers to what they think are very simple questions. They are expecting a simple answer to their simple question. 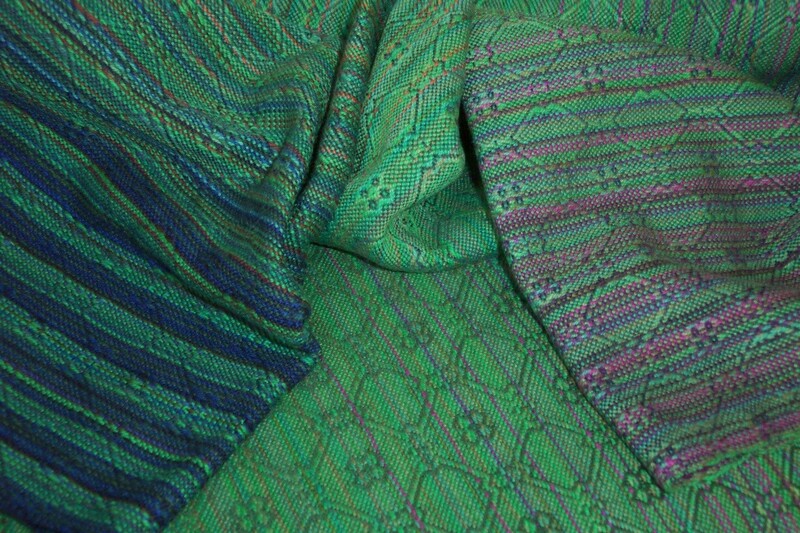 The problem is, weaving (like life, really) is anything but simple. In fact, it can be quite...messy...in terms of the things that need to be factored into any decision. Since the vast majority of people learning to weave are doing so as a pass time, a hobby, perhaps a long held dream to make their own fabric, or even just an undefined desire, many expect to be told to do x, y and z and then they 'know it all'. But it isn't that simple. There are very few 'black and white' considerations when it comes to the creation of a textile; rather, there are many different shades of grey. Although I've posted about this many times before, I will use this example again of how things...depend. Even though they are both 100% cotton at about the same thickness (or grist, or yards per pound), they are quite different and they will behave differently. First of all there is the staple length. One has a staple length of approximately 3/4" which is about the shortest staple length used to spin yarn. The other has an average staple length of just under an inch. 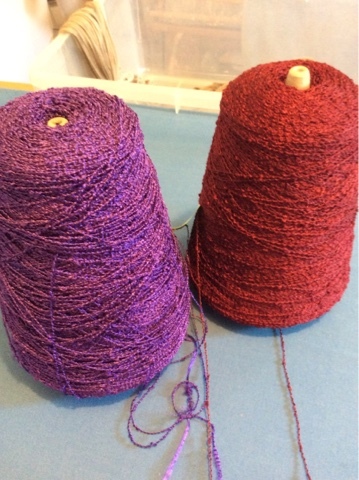 One was carded (the shorter length staple) and spun open end which produces something akin to a woolen spun yarn - lofty, more air in it, weaker than the other - which was combed, ring spun, more like a worsted yarn. So yes, even though they both have the same number of yards per pound (approximately) they are two very different yarns. 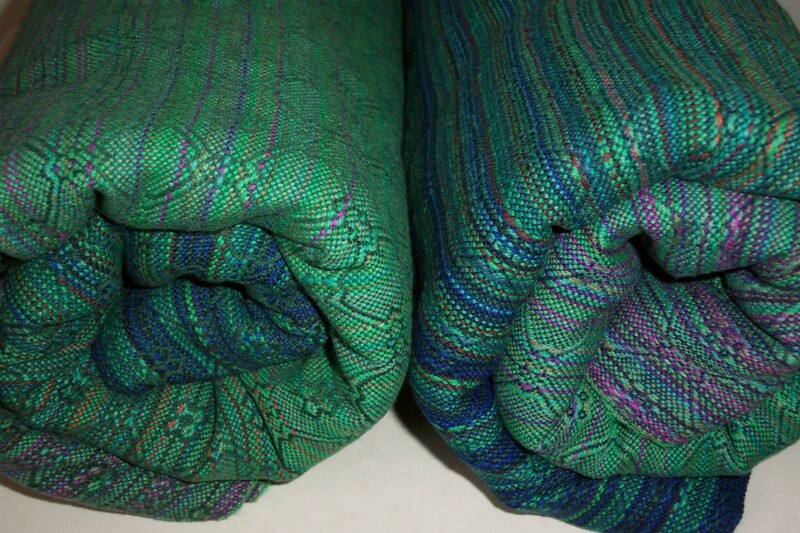 They will behave differently as they are used and will make cloth with different characteristics. Which is better? (Wait for it.) It depends. What type or quality of cloth do you want to make? The shorter staple loftier yarn will be more absorbent, but weaker. The other yarn, more tightly spun, will be stronger, but less absorbent. Every once in a while things turn out pretty much the way you hope they will. So it was with this warp. As for whether or not they are 'perfect', that will be in the pudding, so to speak. The cloth is intended for baby wraps and each momma-to-be will decide on how long she prefers hers to be. There is plenty of yardage, perhaps even enough for a small 'blankie' for little one - or some other application of momma's choice. 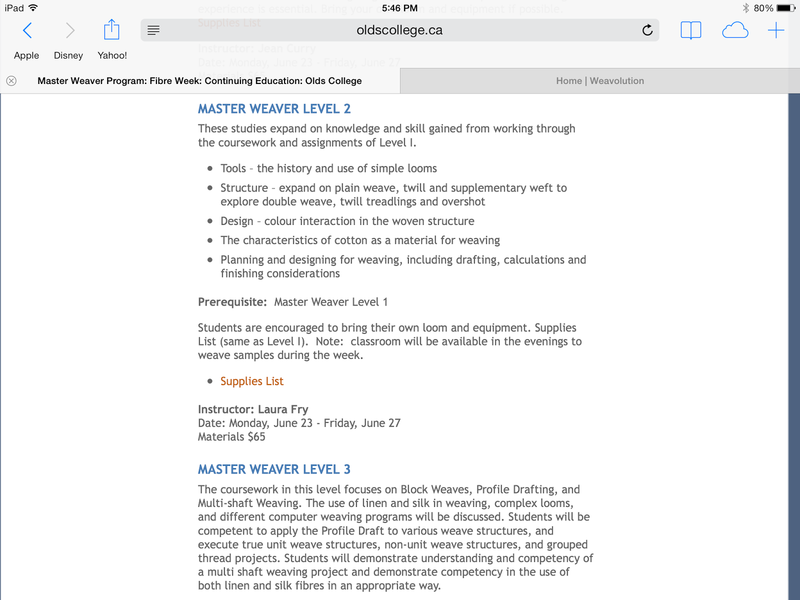 When I originally talked to the college about having the master weaver class here in Prince George, it was kind of a huge gamble - we are just a day's drive from Olds College and there is no Fibre Week - it is just 6 days of intensive study. Would we get enough people? Would others see the value in this program, too? But people kept asking questions and - taking a very deep breath - we went ahead with it. Today I received the class list (seven students) with notification that the binders are on their way. We have made arrangements to remove as much extraneous stuff from the guild room as possible, the guild drop ins will be cancelled for the duration.